Centenary leaflet reproduced by kind permission of Mr Charles Rudland. We commend this short history of our Church to you, aware of our inadequacy, and the incompleteness of the record. As you read, it is our hope that you, with us, will be led to praise God for the work and witness of this Church over the past one hundred years. Great things were happening in England in 1887. It was the Golden Jubilee of Queen Victoria. Great things were also happening in Elmswell that same year. Kelly’s directory states that in 1887 on the Norwich Road a Tabernacle made of iron and seating 300 was erected at the cost of £200.00. Elmswell was destined from the beginning not to remain a small rural village nestling around its large L shape green. It was observed by a Mr. White in 1790 that, “Elmswell was linked to Bury St. Edmunds and Stowmarket by good roads”. This and the coming of the Eastern Union Railway in 1846 (which incidentally cut the foot off the green at the joint) helped the rapid progress and expansion of the village. In Mr. Sinclair’s Elmswell, he notes that in 1844 there were five “pubs”, three tailors, two boot-makers, two bakers, two grocers, two butchers, two smiths, a wheelwright, a carpenter, a cutler, a woodman and Miss R. Matthews, School Mistress. There were timber yards and saw mills and in 1847 a foundry called the “Blackbourn Iron Works” in the Ashfield Road. Flour mills were added in 1865-98, a print works in 1909. Then in 1911 the Bacon Factory was opened. Also in the early 1900’s the village boasted a Lloyds and Barclays Bank and a Postal Telegraph Office. By 1922 a motor omnibus service from Walsham-le-Willows ran through the Village Mon, Wed, Thurs & Fridays. The population had increased from 451 in 1811 to 864 in 1931. Today the population is approximately 2,500. As in most villages at the opening of the l9th century the Parish Church of ‘St John the Divine’ was the only place of worship. Then in 1818 the first Methodist Church was built. A large building with a gallery and seating 700. This was replaced by the present Church in 1898. Miss Caroline Duffield Watts lived with her sister Elizabeth at Wetherden, where she ran a ladies day and boarding school. Since the age of 23 she had been actively engaged in christian work starting with a class of labouring men in the village of Wetherden some of whom were converted. The work spread to neighbouring villages, more especially to Elmswell where sometime prior to 1884 she concluded a fortnights mission in a cottage which then stood on what today is Thurlow Nunns car park. Both rooms of the cottage were packed and the power of God being present, many of the most unlikely people were converted. At the end of the two weeks a large tent was erected in a meadow at the back of the cottage. In the tent and the cottage (now being used for after meetings) many wonderful cases of conversion took place. The Methodist friends allowed Miss Watts to hold the larger meetings in their Church. On Saturday evenings the prayer meeting would sometimes last until midnight. Miss Watts not wishing to set up a rival work urged the converts (there being about forty men) to join the Methodist Church, this they would not do, but formed themselves into a membership and took the Lords Supper once a month on a Tuesday evening. In 1884 Miss Watts had a small iron Church built in front of the cottage, this was screwed down onto wooden blocks sunk in the earth. Miss Watts continued to engage in evangelistic work giving all monies she received for her services to the building. As the work continued to grow so the church building was not large enough to contain it. Having received an offer for the building from Mr. Thomas Simpson of Barclays Bank Stowmarket, who wished to use it as a Mission Hall in connection with the Anglican Church at Combs it was sold, realising the whole of the original price £50.00. Miss Watts bought with her own money a piece of land on which to erect our present church. This was made over by deed of gift to two trustees, Mr. Thomas Simpson and Mr. Chas. Partridge, the deeds being kept by Barclays Bank at Stowmarket. Almost nothing is known of the erection of the new building apart from an incident concerning the foundation. A young man (a recent convert) volunteered to dig the foundation trench, in his ardour he dug so deep that the number of bricks needed to fill it was, at that time enough to bear a three storey building. The materials were bought from Hewitts of Stowmarket (now Jewsons) and Warrens Iron Foundry (Nunn & Thurlows) at the total cost of £240.00. 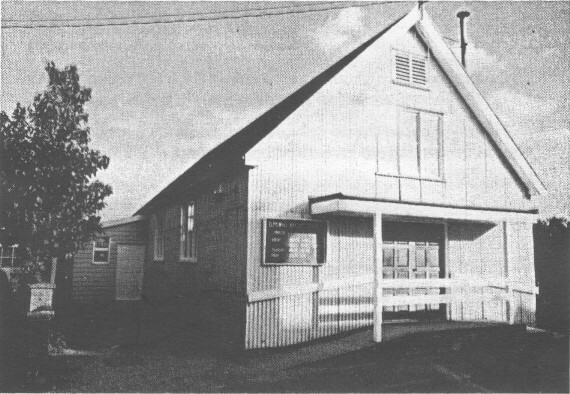 The building of it was done by Mr. John Borley, the new building known as “The Mission Hall” was also affectionately known as “The Tent”, to others it was the “Tin Tabernacle” and to the official directory of Suffolk “The Tabernacle made of Iron”. The official opening was on Queen Victoria’s Golden Jubilee 1887. A cold lunch was provided in the hall, afterwards teas were served on Mr. Lord’s meadow. There was a membership of 90 also a Sunday School of 90. In the same year a Womens Meeting was established. Little is known of the early years of the Church as no records of Church meetings are available until 1919. In that year Mr. Dinnage was called to the pastorate at £1.00 per week rising to £1 10s 0d by the end of the year. Until then Miss Watts had preached since the commencement of the work in the village. A note she wrote says “for over forty years I preached continually”. It was during the ministry of Rev. W. H. Wheele in 1922 that the Mission joined the Baptist Union, from then on to be known as the “Elmswell Baptist Church”. The vestry was added in 1922 by Mully Bros. There can be no doubt that joining the Baptist Union at that time not only gave the work a solid footing but also provided opportunities of fellowship with other Churches. There has over the years been at least three groupings with Norton and Bardwell Baptist Churches, this includes in recent years belonging to the “Bury Group”. This was formed in 1969. Rev. R. D. Edwards being the first assistant minister. Miss Watts died 7th March 1930 and a brass tablet and picture are to be found in the Church. The preaching, teaching and witnessing of the Church has always kept central The Gospel of our Lord Jesus Christ. To this end The Lord has brought many men and women into the work. Some for a short time others for many years of faithful service. Typical would be a Mr. Cross of Ipswich who came as a lay preacher and in 1929 made a present of the church clock. In 1955 Mr. & Mrs. G. Lange went out from the Church to work with the “Miners Mission” in Austria. Mr. Lange later became pastor of the Baptist Church in Graz. There has always been a keen missionary interest and some of the missions that have been supported include “Reageons Beyond” “W.E.C.”, “China Inland Mission”, “Miners Mission’ , “Faith Mission”, Oriental Missionary Society, the Baptist Missionary Society and The Home Mission Fund. Much open air work has been done in the village in past years. The church was lit by oil lamps suspended from the ceiling, until 1928 when electricity was laid on. In 1961 the “Womans Meeting” purchased from their own fund sixteen wooden chairs for use in the vestry. Many of the improvements made to the building over the years have been by the men of the church such as the toilet block in 1967. The oil fired heating system 1970, the Baptistry opened in 1973. The rewiring of the Church and more recently the building of the foyer and front porch and the installation of double doors 1981. Previous to this the main entrance was a single door in the side of the building. The church was registered for marriages in 1951 only just in time for the Secretary’s daughter. By the mid 1950’s a number of people were converted through the work of the faith mission. Following this, monthly “Gospel Rallys” were held on a Saturday evening. A singing group or choir would be invited also a guest speaker. Often the church would be full and many were challenged by the gospel. God has blessed our Church with men and women who have not only been faithful in spiritual matters but have used the practical abilities that God has given them to His Glory. So we find that in 1975 Miss Ann Rudland is with the B.M.S. in Chandraghona Hospital, Bangladesh. As a secretary for two years. Our Church building being made of galvanized iron with an inner lining of wood, needs a constant maintainance programme. It is something like the Severn Bridge, when we finish at one end it’s time to start again at the other. Recently two of our men gave a weeks holiday to replace two of the large church windows. And this year we plan to replace one end of the vestry which has succumbed to old age, and to renew the church lighting. So we can see that both in Elmswell as a village and in the Church a great deal has happened. I’m sure that those good people who began the Church 100 years ago would never have dreamt that so much in the world would change. Just think they had never even seen a motor car and now men have walked on the moon. I’m certain too that if they could have looked forward 100 years to us celebrating the centenary they would have encouraged us not just to dwell on the past but to concentrate on the present and future. It is right that we should remember with gratitude all that many people have done right through from Miss Watts to, in more recent times, Mr. & Mrs. Pearson, but the work that they began and maintained still continues. The world may have changed, some of the methods used within the Church may have changed, but we still seek to serve a God who is the same yesterday, today and forever. We can no longer expect a Sunday School of 90 to turn up on a Sunday morning, but the work among children does continue faithfully with a roll of 20, and over recent years there has been a very active section of the Church under the title of the Youth Club who meet regularly on a Friday evening and something that would have been pleasing to Miss Watts is the Ladies Friendship Group. At this time we have no minister, but the membership and deacons with Mr. Charles Rudland as secretary are able to remain active both within the Church and within the village. Bi-monthly a Church Newsletter and paper are delivered to 430 homes. The membership now stands at 10 with an average congregation at the two Sunday Services of around 20. So the Church continues in good heart giving thanks to God forthe last one hundred years, but also looking forward with complete confidence in Him for whatever lies ahead.